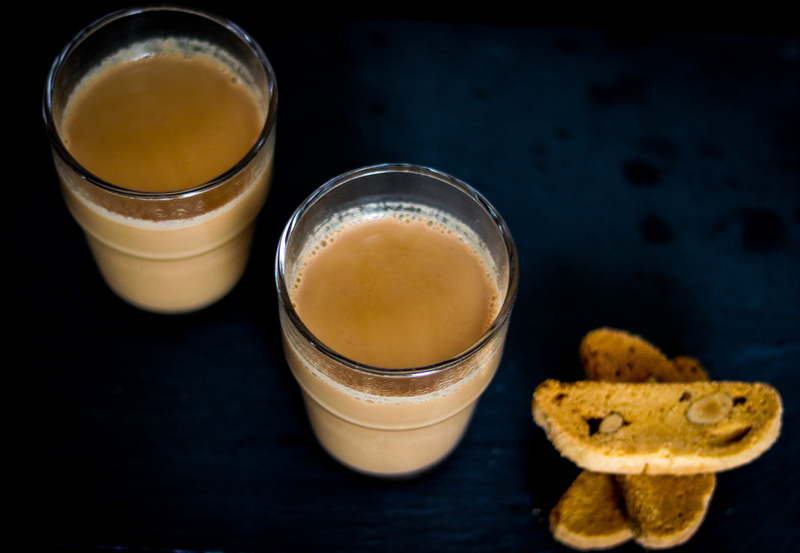 So chai/ tea (masala tea) is everyones favourite in India. Any occasion, any time of the day, be the friends visiting you, or you visiting anyone, the first drink you are offered in India-after water ofcourse) is chai! 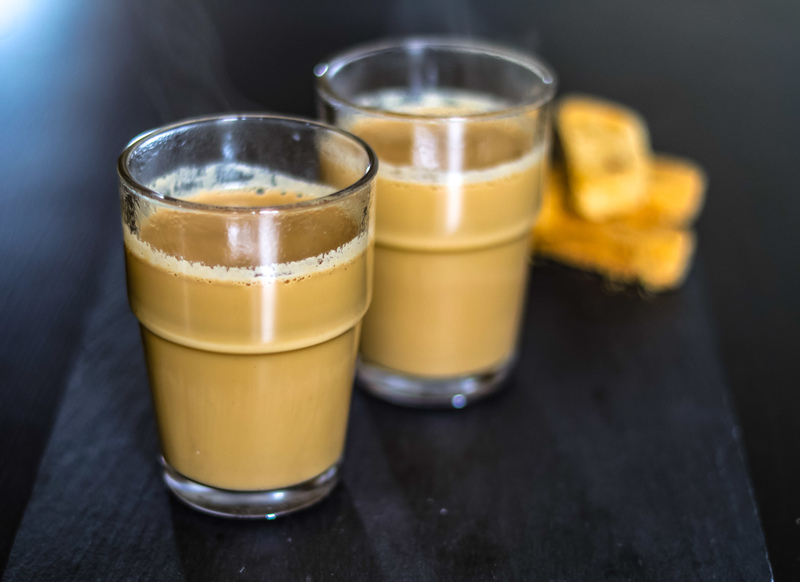 I’m sure all of you will relate to this chai love in India, and it is not only regular brewed tea, that is common, every household has their own version , adding various whole spices, and have a special masala tea, which is again any tea lovers delight. Now I didn’t know, but people in UK are also tea lovers. Amazing .. what effect this “tea/ chai” has on all of us. Did you know that UK has more tea lovers than coffee lovers??yes.. I’m myself not a chai person. 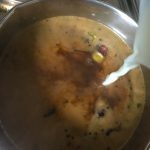 Im more into coffee, but as experimenting with food is my passion, I try and keep on mixing different ingredients, and spices to create different flavours. So, I read about this “jaggery tea” somewhere, and was quite obsessed with it. 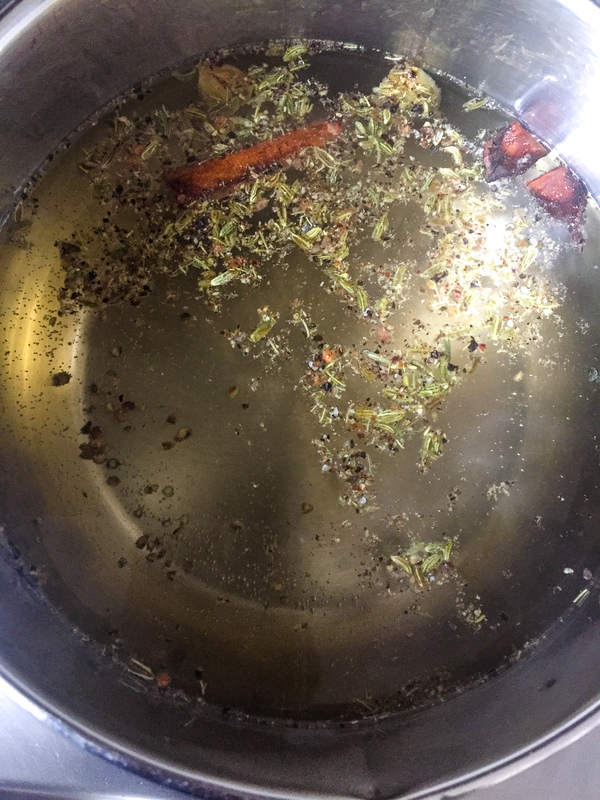 Tried replacing sugar in our regular chai ,it did taste good, and the colour was beautiful.So I tried to mix and match our traditional spices, and brewed it with jaggery and here I had my beautiful jaggery masala tea concoction! 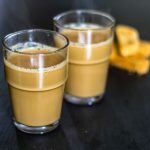 This masala tea with sweetness of jaggery is very simple, and flavourful.Some of you might not like it, because people who are so used to having particular flavours in their tea do not prefer a different strong flavour(like my husband!! ), but people like me, who love experimenting will love this one.Ready to try this out guys? Lets get the spices ready for our masala tea. In a mortar and pestle, roughly grind the whole spices-fennel seeds, cardamom pods, black pepper, big cardamom seeds,and cloves.Keep aside. Add water for the tea , in a pan. 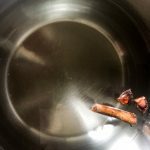 Add Cinnamon stick, and a little star anise. 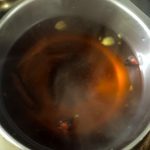 Start heating, and add the ground spices to the water. 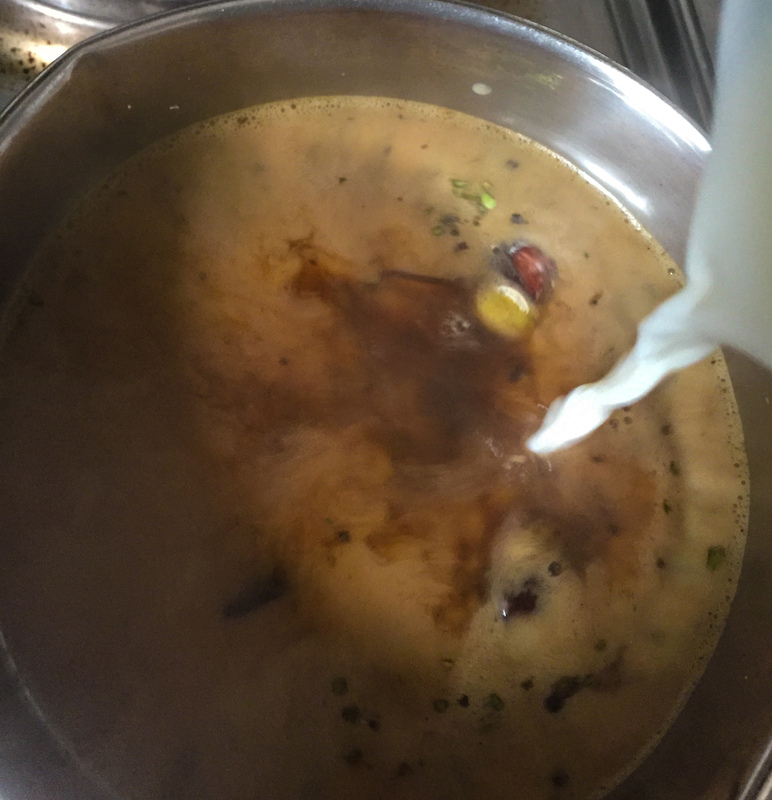 Bring the water to boil, cover and let it simmer for 5 min, so that all the flavours are seeped in the water. 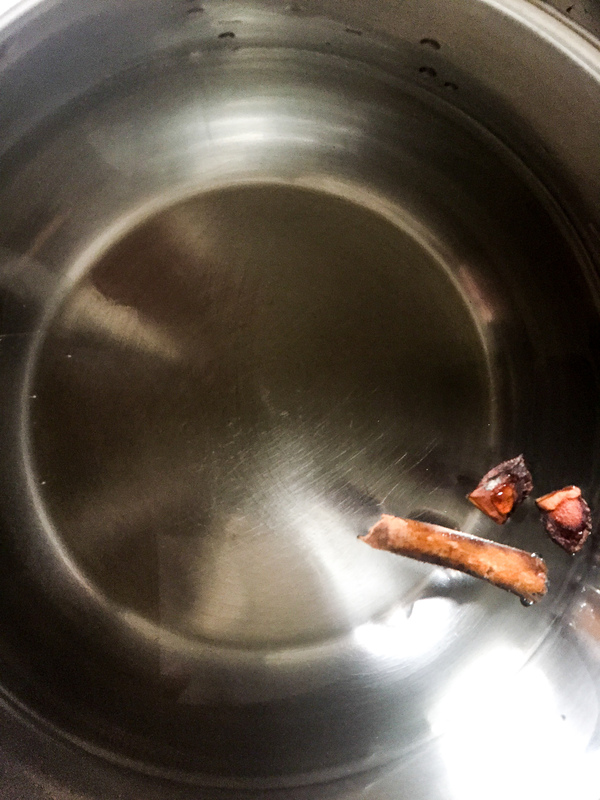 Add jaggery.Stir well, and ensure the jaggery slice is dissolved.Add loose tea(any of your favourites, but should be without any added flavours). Bring the water to boil. Add milk. Bring to boil, and turn off the heat. Let it sit for a minute.Pour your garam garam chai (hot tea), and serve with a snack of your choice! Roughly grind the whole spices- fennel seeds, black and green cardamoms, black pepper, clove.Keep aside. In a pan add water. Add cinnamon stick and star anise.Heat. Add the ground spices, and bring to a boil.Cover and let simmer for 1-2 minutes. 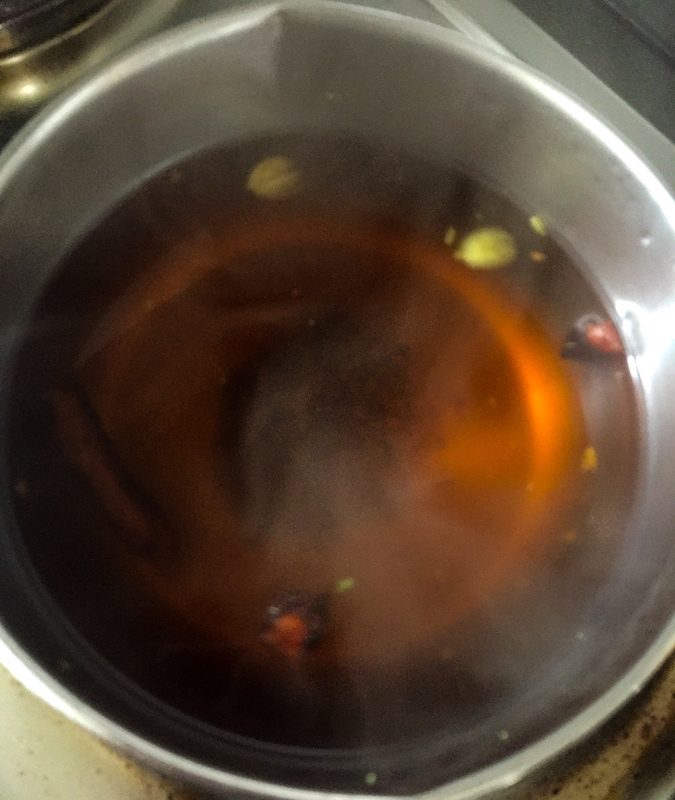 Add jaggery, and stir well so that it is dissolved completely.Add the loose tea, and bring to boil. Add milk, and let it boil. Turn off heat, and let it sit for a minute.Pour hot, into glasses/cups and serve hot with a snack of your choice. You can avoid adding any sweetness if you do not like your chai sweet.But adding jaggery adds a very rustic sweet flavour to your tea. You can use sugar if you do not have jaggery.